Great Britain need to improve after their 6-5 win over Netherlands in their opening game at the Olympic pre-qualifiers, says forward Matthew Myers. 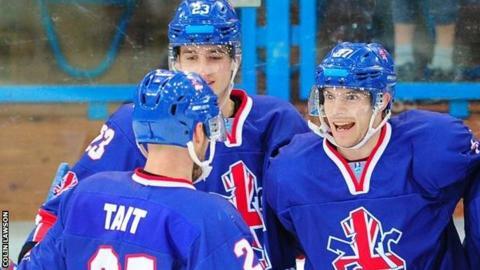 He scored as GB started their campaign to reach the 2018 Winter Games with a positive result in Italy before Saturday's match against Serbia. "We know we have things to work on but that's a good thing," said the Nottingham Panthers player. "We are aware where we have to improve and the things we need to do better." Hosts Italy are the other team taking part in the four-team event at Cortina and only the winners of the round-robin group will progress to final qualifying. Sheffield Steelers defenceman Ben O'Connor added: "Netherlands came out strong and played very well and took the game to us. But we can build on this result. "We were not at our best but we still found a way to win an important game. "We could've let our heads drop when we were up against it. But there is great determination in this GB team and that shone through, especially in the third period."